I’ve attempted this before, but it didn’t work out so well. You can see the finished, botched soap in this post. This time, things worked out much better. Just like the first time, I started with bacon fat. Upcycling this dirty old jar of grease. And, just like last time, I washed the fat. However, this time I decided to use only one jar of fat instead of two. This helped speed the process up measurably. I washed the fat twice just like last time to get out all the residual bacon bits. What I knew this time that I didn’t know the first go round is that washing the fat takes longer than any other step in the process. 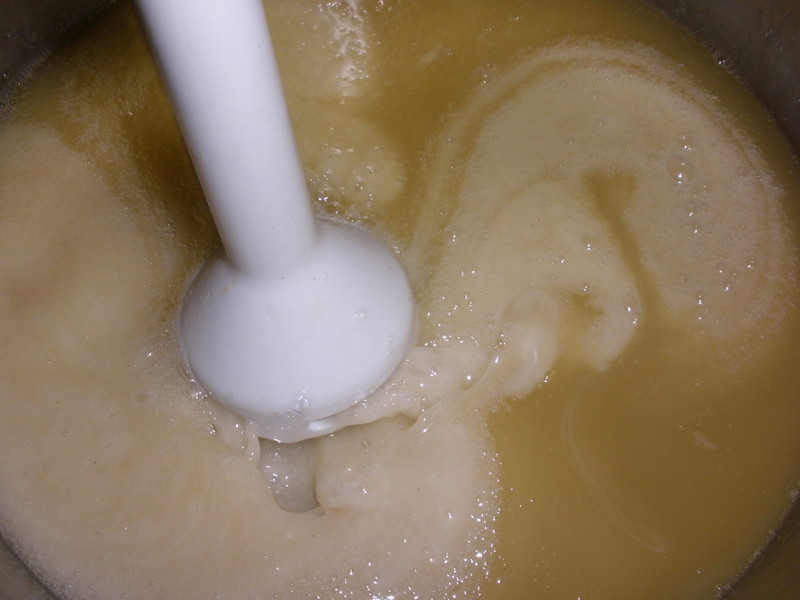 You can save yourself a lot of time in your soap making by using other fats that are already clean. Olive oil comes to mind. So does coconut. You can even find directions on the internet for Crisco based soaps. For now I’m sticking with bacon fat because I always seem to have some around and I don’t have to buy it. Someday I would like to try an olive oil (castille) soap but I’m going to refine my skills with bacon grease first. Washing the fat is the longest step in the process. Now that you’ve washed your fat, it’s time to actually make some soap. My directions from the first experience were pretty thorough, but I learned a few things along the way so I’ve added those golden nuggets of wisdom so that you don’t make the same mistakes I did. Clear your workspace of young children and pets. Lye is not dangerous if you respect it and follow safe handling precautions, but children and chemicals don’t mix. Weigh and melt the fat. 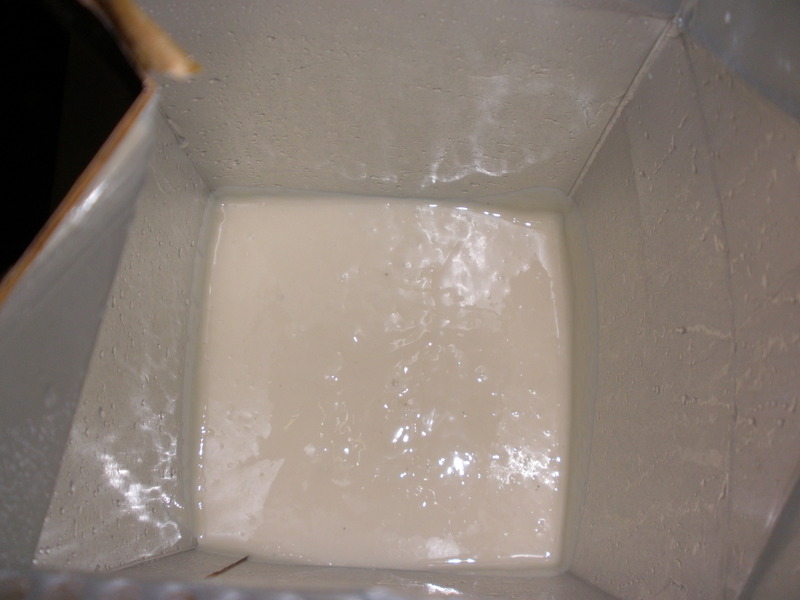 The fat liquified and ready to be made into soap. THIS IS VERY IMPORTANT. Inaccurately measuring my ingredients was the biggest mistake I made the first time I made soap. I used too much lye and the result was a chalky, crumbly soap. This time I got a more accurate kitchen scale. I want this fancy-shmancy one but I’m not willing to spend that much money on it. I found a used one for $60 but I wasn’t ready to spend that much either. We’ll see how much soap I actually make before I start forking out the big bucks on equipment. My new kitchen scale cost $1 at the Women’s Resource Center. It seems to work just fine for what I need. Once the fat is melted, use this lye calculator to determine how much lye you will need. 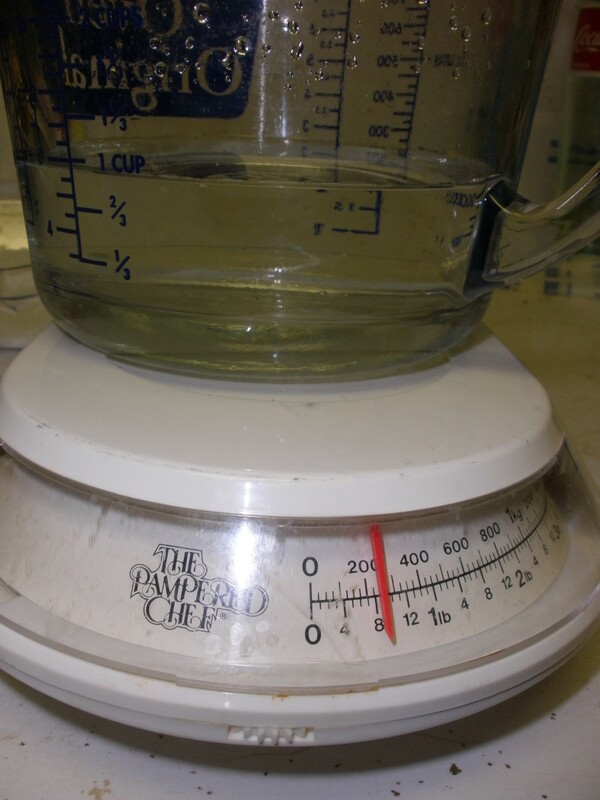 The mass of the water only; I set the scale at zero with the measuring cup on it. It will tell you how much water and lye you need based on the type and mass of fat you have. It will even let you use multiple types of fat so that when you become a soap expert you can create new recipes. Once you have calculated how much lye and water you need, sprinkle the lye into the water IN A HEAT-PROOF GLASS CONTAINER and swirl with a silicone or rubber spatula. (This is an exothermic reaction and gives off A LOT of heat; use caution.) This is where I made my second mistake the first time I made soap. I knew the lye mixture would be hot. I knew it needed to cool. I just wasn’t sure how much it needed to cool. 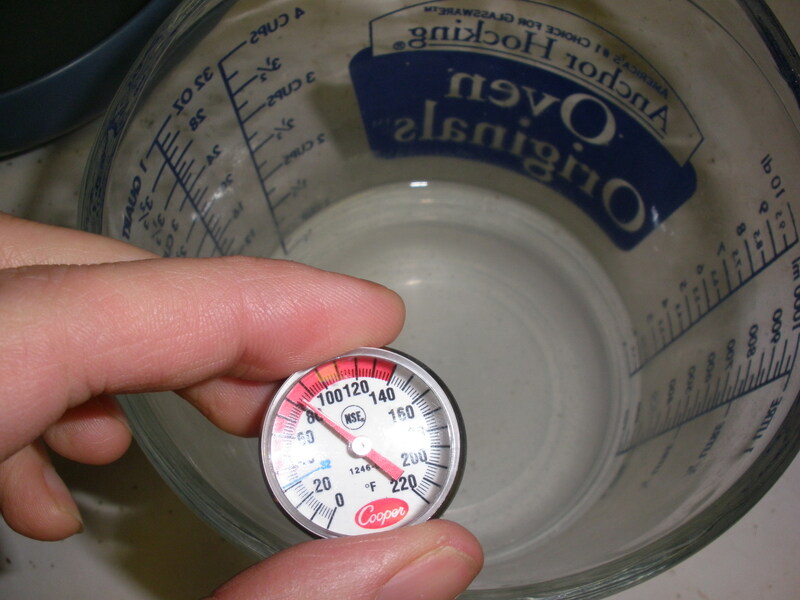 The lye-water solution has cooled to about 82 degrees. 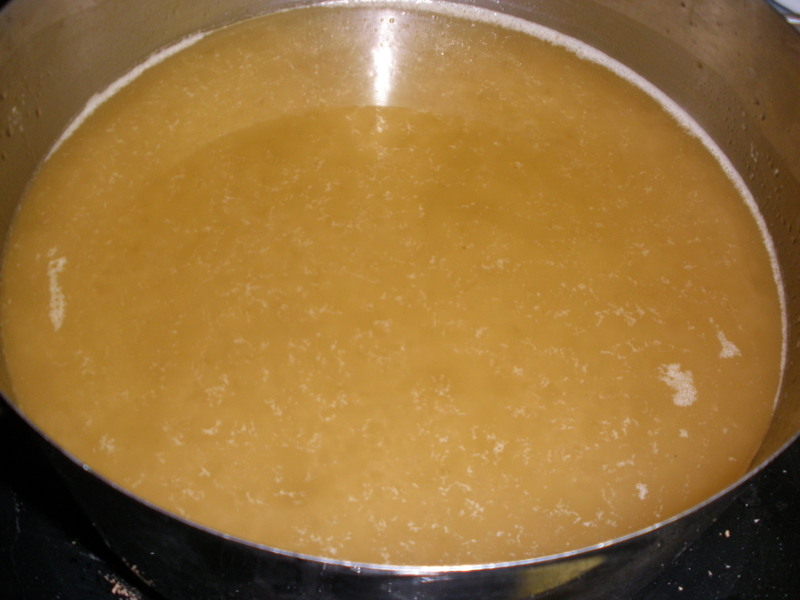 Once the fat and lye are both under 100 degrees slowly and carefully pour the lye solution into the fat and stir continuously with a stick blender. Stir the mixture constantly once you have added the lye. It will take quite a while for the mixture to thicken up to the right consistency. (Especially if you have measured your ingredients correctly; my soap reached trace really quickly the first time because I used too much lye.) Don’t stop stirring even when your arm gets tired. The soap is finished when it reaches “trace”. Trace is when you can see where you have been mixing. In the photo you can just see the path where the blender was. And, in the sake of complete disclosure, this photo is from the last batch of soap; the picture of trace from this batch wasn’t so great. If you are going to add fragrances or herbs, now is the time to do it. Last time I added dried lavender blossoms. That was a waste of perfectly good lavender blossoms. They turned brown in the process instead of being lovely little purple flecks like I’d imagined. This time I stuck with straight essential oils. I’m particularly fond of lavender in my soap so of course, I used that but I added lemongrass again too. 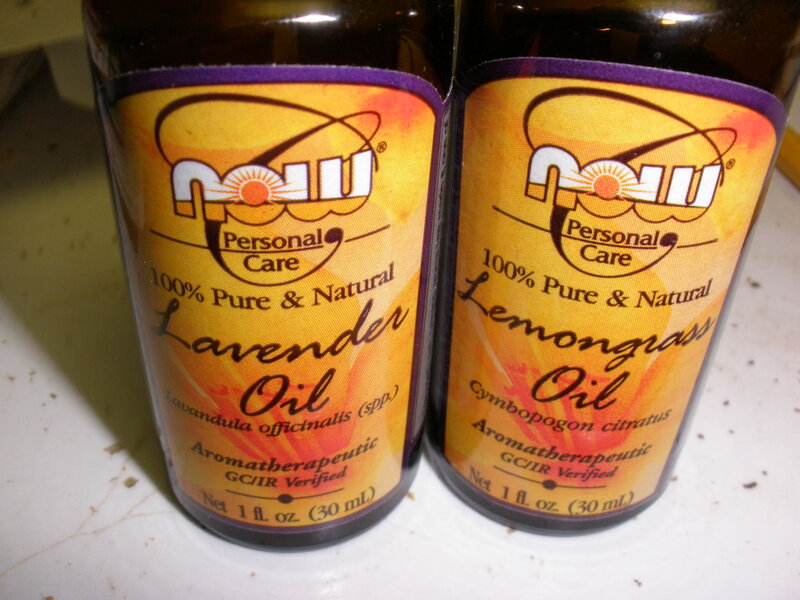 Lavender and lemongrass essential oils. I didn’t add enough oil this time so the soap is only slightly scented. Next time I will add much more. One of the reasons I like homemade soaps (both mine and Fish Creek’s ) is that they make the bathroom smell lovely instead of all soap-y like commercial soaps. The last time I opened a bar of store soap, it about made me gag. It’s amazing how artificial artificial fragrances smell when you get used to smelling real smells again. My friend Alicia keeps me in soap molds. She provided the silk container (which wasn’t big enough for two jars of bacon fat-soap last time) and this giant Goldfish container (which was actually too big for only one jar of bacon fat this time). Once you have blended in any fragrances you want to add, pour the liquid soap into the mold and let it cure for 18-24 hours. Finished soap in my fancy soap mold. Once the soap has cured for a day, you can remove the soap from the mold. Or, if you upcycle an old container like I did, you can just peel the mold off of the soap and discard it. I forgot to take a picture of the soap before I started cutting it, so I had to push it back together to provide you the illusion of “whole-ness”: You get the idea. After you’ve cut your block of soap into bars, all you have to do is wait. Soap needs to cure for awhile. At least three weeks is recommended, but the bars will get harder and drier with age. The freshly cut bars biding their time. So, I haven’t used the bars yet but they cut smoothly and didn’t crumble or get chalky like the last batch so I’m assuming all’s well for now. They seem to be curing nicely and will be ready for use soon. Now that I’ve figured out the process, I think I’m ready to start playing with some recipes. Like maybe this one. Also – I remember what I was going to ask you at the meeting… Do you have a recipe for your salsa? That is something I want to can this summer too since we go through more than our fair share here. ok here’s a stupid question…it doesn’t smell like bacon? Nope! This batch isn’t as fragrant as the last batch but even without much essential oil there’s not a meaty smell. Congratulations! I’m so happy for you! Isn’t it neat? A comment on the scale, we bought the Salter Electronic #1010 (Amazon has it for $35 free shipping) several years ago since we weigh our harvest. Anyway, it’s a great scale. When describing trace I think it looks like pudding! I hope you do try the Citrus Coffee soap. Friday will be 4-weeks curing for it so I’ll be trying it then and will report on it and the other two we’ve been using. Looking forward to your next soap adventure. Again, congrats! Amazing! I love things homemade, and I love the smell of lavendar!!! So what food do you want me to buy that would fit your soap-making needs a little more accurately? Umm, I’ll have to look around. 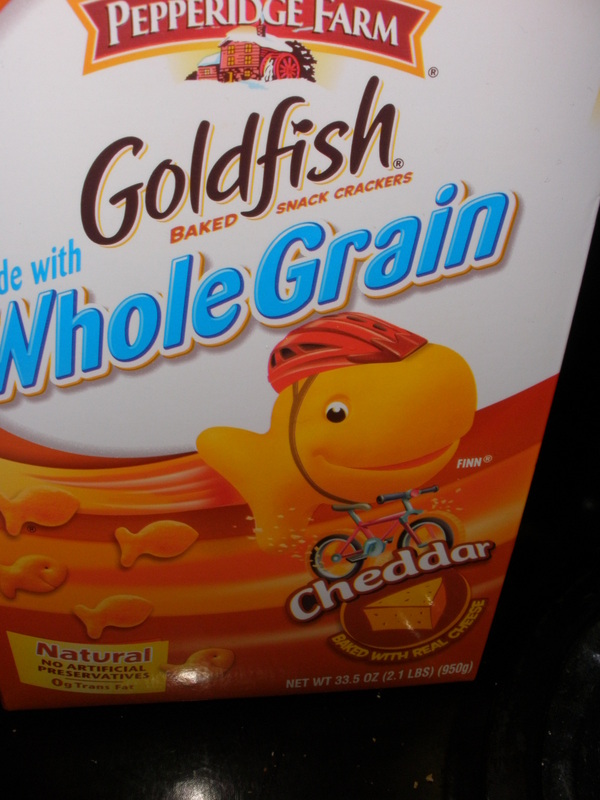 Actually, these goldfish cracker boxes will work perfectly if we just eat more bacon. Hi. Great job! Do you simply was your blender with dish washing liquid and resuse it for cooking, or do you use this one only for soap making? Was wondering how dangerous it is to wash and keep for cooking!! Also.. did it ever happen to you that the lye solution just doesn’t heat up?? I bought some in powder form and added water to about 30g of the powder but somehow it melted but kept cool?! small problem there.. i’ll add warm water next time, slowly.. I just wash it and use it, but if you’re worried about unreacted lye you can rinse it with vinegar; it will neutralize any lye residue. And no, I’ve never had a problem with it not heating up. You shouldn’t have to add warm water. The only thing I can think of is that the ratios weren’t right. How much water did you add to the 30g of lye? Just a note for Virginie, don’t add water to lye! Always, add the lye to the water!! Also, you don’t need to heat up the water. Make sure you are using 100% lye NOT drain cleaner. 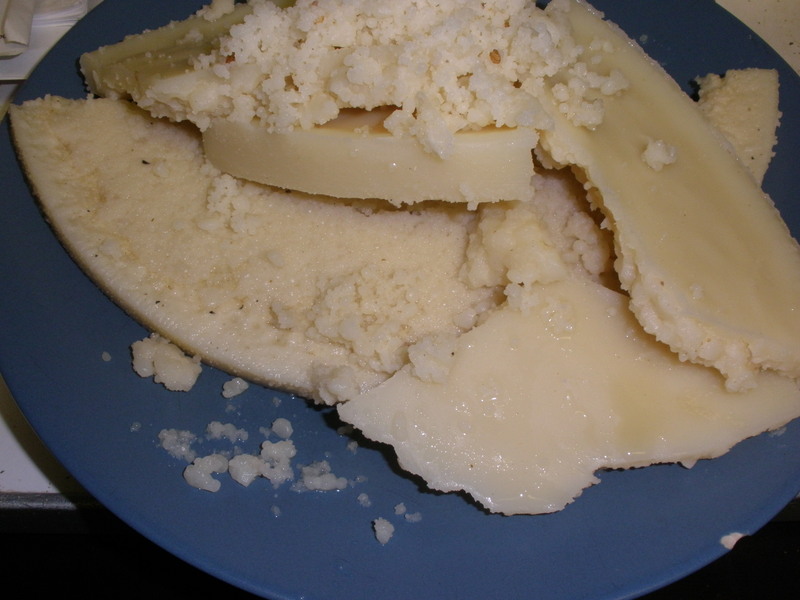 Anything that has been exposed to lye should be used only for lye and not food. You can probably clean it but I’d be concerned the lye was not completely gone. There are some great Yahoo soap groups with soapers who have been making soap for years. 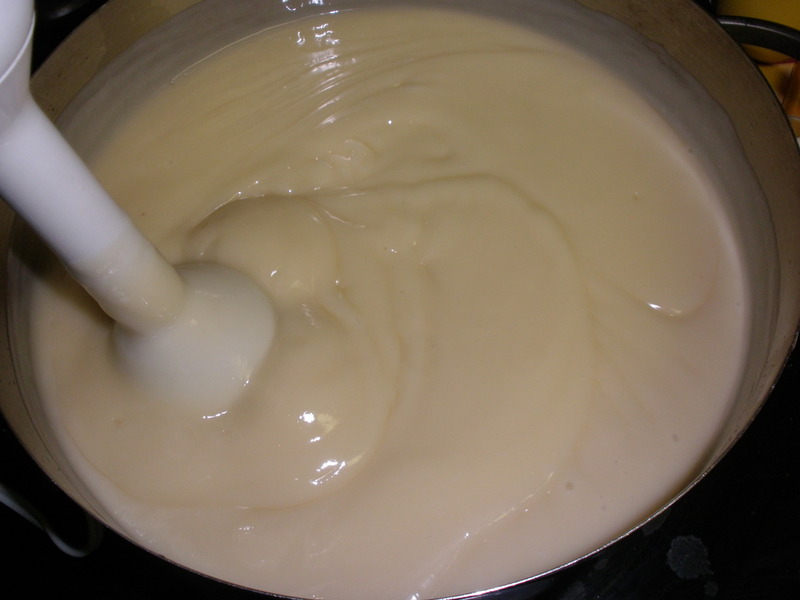 They all recommend separate blenders, spoons and other supplies to be just used for soapmaking. I’ve only made four batches so far and love it. 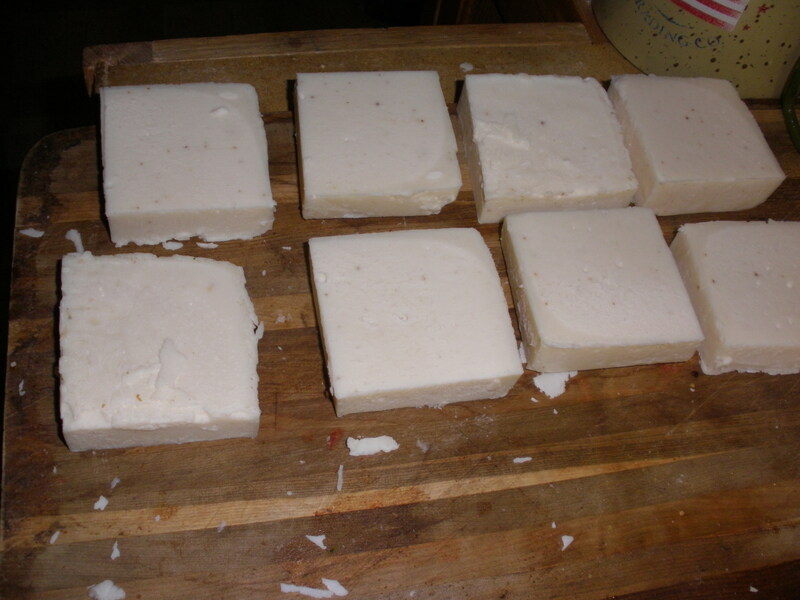 If you want to learn more about soapmaking, check out the Yahoo groups. All interested soap makers and soap maker wantabees are welcome! Virginie here, thanks for all your replies, that was quick! I’ll use the same beaker and glass for my soaps then and not use them for food: they’re already hidden from the rest of the housemates! and I did just add the powder to the water rather than the water to the powder: about 30g powder into 80ml water, as calculated from the soap calculater: And olive oil, coconut oil, and jojoba oil. I’ll have a look on yahoo groups! Cheers for all the info! I think my lye was not pure lye, it was the stuff they use for cleaning that i bought in a drugstore.. i’ll check more carefully next time. It’s hard to find pure lye. I got mine from soapmaker friends after looking (in vain) at stores in town. This weekend I actually found 100% pure lye for $3.79 a pound in the drain cleaner aisle at a local store. I didn’t buy any because I still have some, but at least I know where to get it now. I hope to try some other non-bacon soaps soon, but I have another quart of bacon fat waiting for me now so I might try a bacon-fat blend. 🙂 I’m thinking about adding coconut oil to improve the lather of my soap. I love your idea for using bacon fat for homemade soap. I knew I was saving that jar of grease for something…..
Have you ever tried other fats for this? We eat a lot more chicken than bacon here, so I was wondering if chicken fat could be used in the same way? 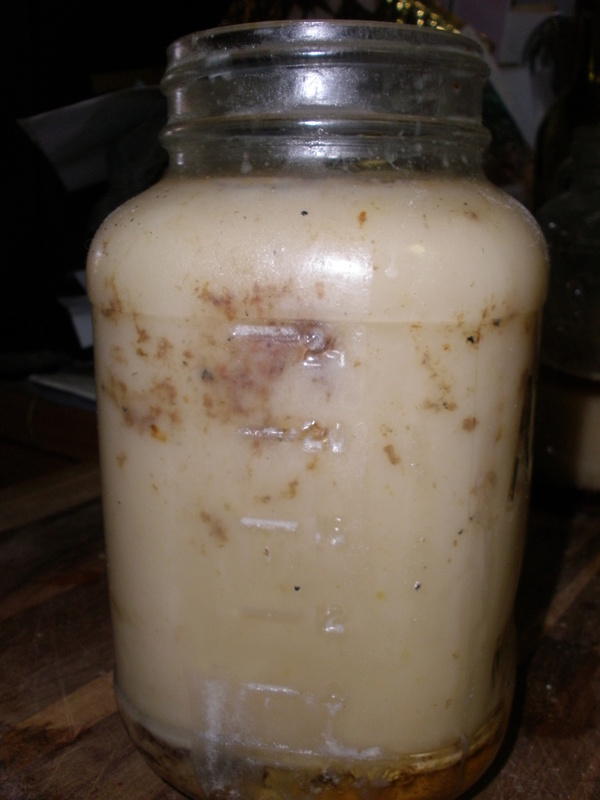 Would it be okay to use your image of the quart jar of grease and bacon fat in an article I’m writing “Bacon Fat and the Healthy Oils?” I’d be happy to give you photo credit. Excellent. I’ll send you a link for the article once it’s published. We have each article approved for scientific and legal terminology. Read our article with your bacon fat drippings jar image at http://www.live2agewell.com/BaconFat.html. Thank you, again.